INFOGRAPHIC / Andris Piebalgs, the European development commissioner, has called on EU member countries to compensate the aid cuts from the bloc's long-term budget that were agreed by EU leaders at a summit last Friday. Speaking at an informal meeting of EU development ministers in Dublin on Tuesday (12 February), Piebalgs said he regretted the deep cuts to the EU budget for 2014-2020. “Cuts must not cost lives,” Piebalgs said, adding that the EU and most national governments had promised to allocate 0.7% of gross national income (GNI) for development purposes by 2015. “This is the absolute minimum. Today, the EU stands at 0.42% – just a little more than a half. If the EU wants to address the problem of development, it needs to deliver on its promise,” Piebalgs said. Joe Costello, Ireland's trade and development minister who chaired the Dublin meeting, told EURACTIV that the Irish EU presidency would be looking for the older 15 member states to recommit to the 0.7% target. How big are the cuts to development aid budget? Comparing the figures agreed by EU leaders a week ago with the Commission's original budget proposal – which kept with the 0.7% commitment – EURACTIV has evaluated the difference at €6.3 billion in total. The two main pillars for the EU’s development aid are the European Development Fund (EDF) and the Development Cooperation Instrument (DCI). Both have been slashed significantly more than the EU budget as a whole. Last Friday, EU leaders agreed on a total budget of €960 billion for the EU for 2014-2020, significantly less than the €1.025 trillion originally proposed by the Commission – a difference of at least 6.34%. Similarly, EU leaders agreed earmarked €20.6 billion for the Development Cooperation Instrument (DCI). However, the DCI calculated as a proportion of cuts to the heading Global Europe, as no breakdowns are available, is €17.3 billion. The difference there therefore amounts to 16%. At a press conference after the summit, both Council President Herman Van Rompuy and Commission President José Manuel Barroso stated that the budget for development aid had been preserved, and even benefited from a small increase. However, both referred to the development aid budget for the previous multi-annual period (2007-2014), and not to the Commission's original proposal for 2014-2020, which aimed at keeping with the 0.7% GNI pledge. Asked by EURACTIV to comment on the reduced budget for development aid, Barroso compared the new figures with the former seven-year period and called it an increase. “Not big, but an increase. I think we can say the EU keeps its commitments for the poorest of the world,” Barroso said. He added that the Commission would had preferred “bigger amounts”, but in a difficult financial situation, “this was the biggest possible result”. Where could the missing billions come from? It is still unclear whether the European Parliament will approve the EU budget for 2014-2020 as agreed by EU leaders. If the budget is rejected, annual budgets to the level of the budget of 2013 will apply. The impact on development policy is not expected to be too big, but longer-term initiatives such as the Global Alliance for Resilience Initiative (AGIR) would be more difficult to plan and implement. Could the FTT provide a solution? Additional finance could come from other sources, like the Financial transaction tax (FTT) recently agreed by 11 EU countries – Austria, Belgium, Estonia, France, Germany, Greece, Italy, Portugal, Slovakia, Slovenia and Spain. Under the ‘enhanced cooperation’ procedure, other EU countries can join at any time. France said it was willing to allocate 10% of the revenue “to the benefit of the poorest in the world". It is unclear however how the new revenue, estimated by a German institute at €37 billion per year, would be spent. “Europe contributes about 60% of money that’s spent on the developing world. But if we don’t have enough, we have to look for other sources. And of course if we want to show the leadership on this, we expect the wealthy member states to cough up,” Costello said. Reacting to the conclusion of the European Council on the EU long-term budget, Natalia Alonso, head of Oxfam's EU Office, said: “The freezing of the EU’s anti-poverty aid is a breach of faith. The promise to give 0.7% of national income by 2015 to the poorest is off track. EU leaders, like all other countries, should be held accountable for their commitments." “The consensus reached today could have potentially negative consequences on the ability to achieve global anti-poverty goals, especially in Africa. It comes short of what’s needed to tackle pressing global issues, from sustainable development and increasing disasters, to food security and social justice. It will undoubtedly also impact negatively on the ambitions of Europe as a global player,” Alonso stated. Reacting to the European summit deal, GUE/NGL President Gabi Zimmer accused EU leaders of an assault on the future of the young and the poor. “Unfortunately, irrational austerity policies have come to dominate thinking on the European budget. Cuts to the European Development Fund that provides aid for development cooperation is a major blow for the global poor." "Sadly, conservative eurosceptics have won the day. Now, the consent of MEPs is required and I hope that the leaders of political groups in the European Parliament follow through on their speeches and reject this austerity budget," the MEP said. European Union leaders have reached a deal on the bloc’s long term budget that effectively freezes development aid spending for the world’s poorest at around current levels but cuts it significantly compared to the European Commission’s budget proposal, said Eloise Todd, Brussels director of ONE, a global advocacy and campaigning organisation. “EU leaders missed their opportunity today to take Europe a big step closer to its promise of spending 0.7 percent of income on smart aid. But it is clear that some leaders listened to the voices of citizens across Europe and did stop short of cutting into current levels of aid, a backward step that would have been a disaster for the world’s poorest. “Now it’s all eyes on the European Parliament. In October, MEPs described the European Commission’s original external spending proposal as the ‘bare minimum’. Fully funded, that proposal would see millions more of the world’s poorest given access to education, clean water and lifesaving vaccines. It is now up to MEPs and President Martin Schulz – a vocal supporter of development aid during these negotiations – to do everything in their power to make it happen. 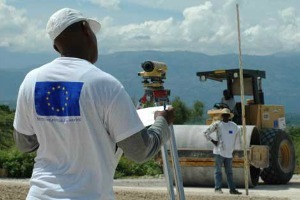 Europeans overwhelmingly support development aid, and will be looking to the Parliament to do what’s right,” Todd said. After 24 hours of talks, EU leaders struck a deal on the Union's seven-year budget at a meeting on 7-8 February. The 2014-2020 EU budget is smaller than it was in 2007-2013. It goes down to 1% from 1.12% of EU gross national income (GNI). It is the first net reduction to the EU budget in the Union’s history.